Olds 98 models included two- and four-door Holiday Hardtops, a four-door Town Sedan, a four-door Sport Sedan with a wraparound rear window, and a convertible. A single 325-hp, 394-cid V-8 engine was available, and it was mated to a four-speed Hydra-Matic transmission. Total sales for the 98 in 1961 were more than 40,000. The same five Oldsmobile 98 models were offered for 1962 and the body was even more conservative, with a looped grille in front, a curved side-scallop with a big trim patch at the front of the driver’s door and no fins at the rear. Sales jumped by 50% to nearly 65,000 Oldsmobile 98s. For 1963, a new Custom Custom Sport Coupe joined the lineup, and it used the Starfire’s 345-hp V-8. The rest of the 98 lineup enjoyed a power bump to 330 hp. Visually, Oldsmobile smoothed out the 98’s side panels and added a ridge along the top of the fender to form the shape of the taillights. A new slim-line transmission cut the front floor tunnel significantly, climate controls could now be operated by a single unit, and a tilt wheel option was offered. 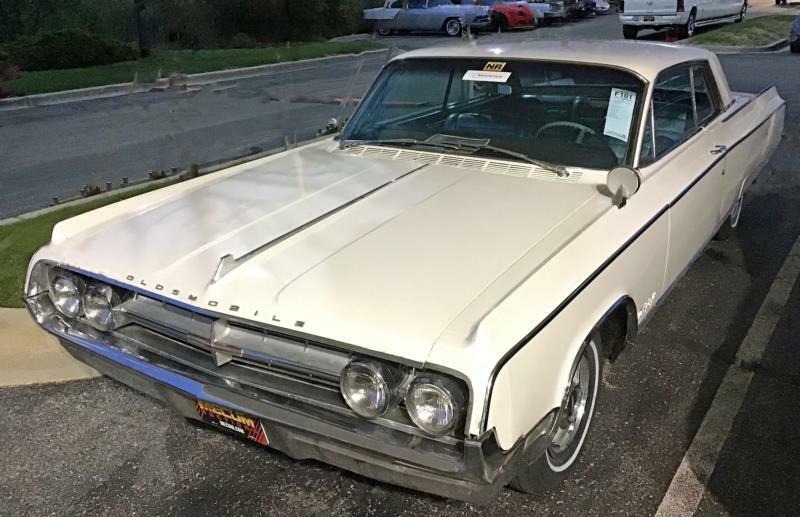 The 1964 Oldsmobile followed the very clean lines of the 1963 models with trim accents along the ridgelines and horizontal taillights. Corner lights were fitted and AM/FM radios offered, along with cruise control. Ten interior colors were available and 15 exterior paint tones. The 1965 model would see the start of “coke-bottle” side styling and the horsepower race would begin in earnest as the standard V-8 increased to 425 cid and 360 hp with the option for 370 hp. Oldsmobile 98s from this period are reliable workhorses, often kept by older owners for long periods of time, and consequently well-maintained. Apart from some issues with slim-line automatic transmissions, they are usually trouble free. As an added benefit, they are typically equipped with power brakes, steering, windows and seats, and often have air conditioning. As genuine six-passenger cars, they make excellent long-distance cruisers.